Last night Jane and I travelled to Edinburgh to see The Queen. What it is to have connections. Well, alright we didn’t actually meet Her Majesty in person, instead our lovely friends Dusty and Joy, Jane and myself sat in a darkened room in Wester Hailes and watched Stephen Frears’ film about the House of Windsor during those strange couple of weeks in 1997 in the days between Tony Blair’s election to government and the death of Diana Princess of Wales. At times the film felt like a comedy, while at other moments like a tragedy. Overall it was an intelligent and moving film. 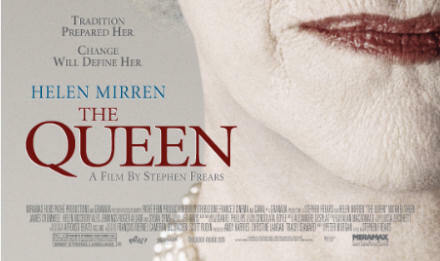 I felt great sympathy with both The Queen and with Tony Blair, played by Helen Mirren and Michael Sheen respectively, a clash of two cultures and upbringings. I longed for the Royal Family to realise the feelings of the people but could quite understand their sense of shock and that their perception and interaction with Diana was completely different to her public persona. There were a few moments in the film that I found most moving. Charles flying to Paris to see Diana’s body; how hard must that have been? The Queen’s landrover breaking down en route to a stag hunt, and the Queen crying at the side of the river. The Queen’s walkabout outside Buckingham Palace once she returned to London, the sea of flowers on the pavement placed in memory of Diana and the bouquet of flowers presented to The Queen by the little girl in the crowd. The acting was first class. I moved out of London and back to Scotland that day. I sat exhausted (having driven through the night) on Mum’s sofa in Selkirk watching the funeral on television with my friends Danny and Greg. What an odd and memorable day that was. What a splendid film. Tonight I’m off to Glasgow to see MotÃ¶rhead in concert. I thought it was a great film too. Good to have that film going down in history, almost as real history itself. Because I think it was VERY real – hardly fictitious at all, I suspect. Except maybe Helen Mirren’s legs. They didn’t look like the Queen’s. I was preaching my first ever sermon that day; I remember you standing at the bottom of the stairs at Lansdowne, saying of the death “Well that puts my 25 in perspective”. Strange the way you remember things.